Safety googles! Ventilation! Extinguish all unnecessary flames! 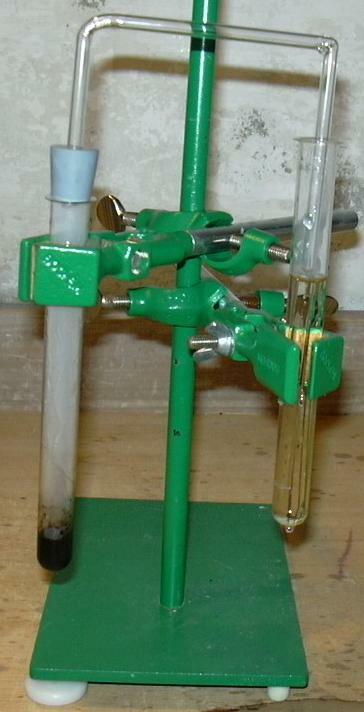 Secure both test tubes such that the plug can be attached to one test tube and the gas inlet tube reach as far as possible into the other test tube. Add a spatula-tipful of sodium carbonate into the test tube where the gas is to be injected and add a couple of drops of diluted potassium permanganate solution. Fill it about two-thirds of the way up with water. Add to the other test tube about 0.5 ml ethanol. Then slowly and carefully add about 1 ml concentrated sulphuric acid leading to a marked temperature rise. Firmly apply the plug with the gas inlet tube to the test tube. With the burner heat the acid/alcohol mixture until a noticeable gas formation begins and then extinguish the flame immediately. The exothermic reaction will usually continue on its own. A strong coalification occurs, the gas formation can be quite turbulent. 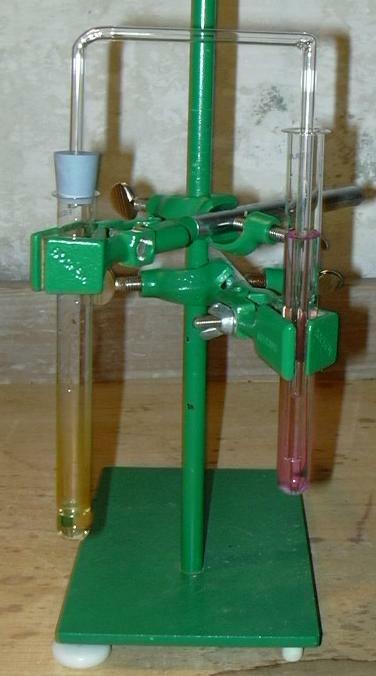 The potassium permanganate solution is rapidly decolorized and acquires a light brown color due to the development of manganese(IV) oxide. If some of the solution splatters this presents no danger. Wait until the formation of gas ceases and then remove the plug in order to avoid blowback. The reagent solution can be simply discharged into the drainage. After cooling one carefully adds 4-5 ml water to the gas formation mixture and disposes it as halogene-free organic waste. Tarry deposits can be removed from the test tube with acetone or the like, although not fully. As in the case of Demonstration of diethyl ether water is extracted from ethanol with the help of concentrated sulphuric acid, however from one molecule of ethanol one molecule of water. With the potassium permanganate solution formal hydrogen peroxide is attached to the ethylene, manganese(VI) is hereby reduced to manganese(IV). Apparatus before test procedure, for gas formation a rather dirtied glass was used, as tar is produced in any case.